I just love roast chicken! For days now I’ve been stumped about what to write about of one my favorite foods. Do I talk about restaurants that, in my opinion, serve an excellent bird? Share other recipes? Dive into the dos and don’ts of roasting? In the end I decided to keep it simple and direct. As my ode to roasted chicken, I offer 5 words: it’s deep and it’s real. Dress it up with a myriad of herbs and spices or go simple. Roast it low and slow or broil it up. I love it all. 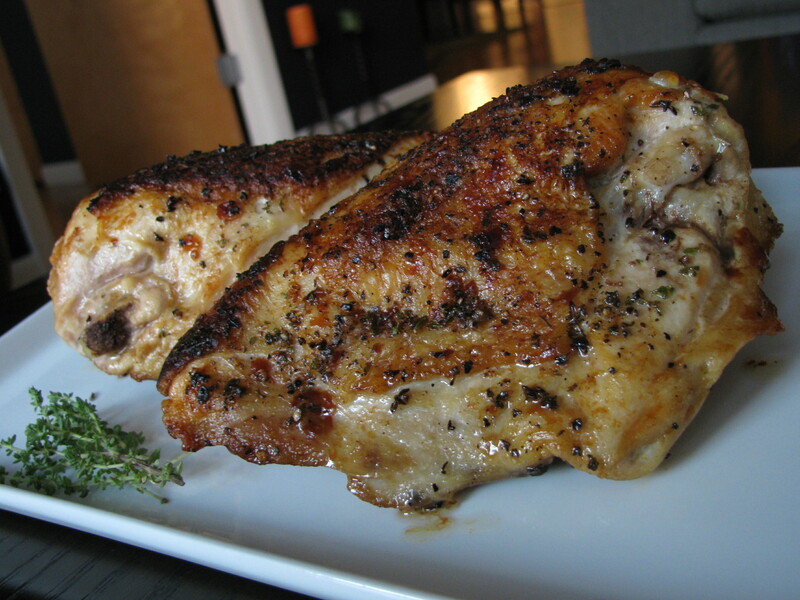 This recipe is simple and really plays on the natural flavor of the bird. The truth is all you really need to make a great chicken is salt and pepper. I add woody thyme and a lemony pan sauce to cut through the rich and crispy skin. If this recipe doesn’t turn you into a fan of roast chicken then you may need to get your taste buds examined. JK! But seriously…try it. And P.S. eat more chicken!! Heat a large ovenproof skillet (preferable stainless steel) on medium high heat. Strip the thyme leaves from the stem. Chop them finely. Pat the chicken breasts dry with some paper towels. Drizzle ½ tbsp of oil over the chicken and rub all over to coat the chicken. Sprinkle with salt pepper and thyme. Place the chicken, skin side down in the pan and sear. Flip the chicken over after about 2 – 3 minutes and sear the other side for another 2 – 3 minutes. Once the chicken is browned, turn the chicken skin side up and place the pan in the oven. Baste the chicken every 10 minutes using the drippings in the pan. Cook for 40 – 45 minutes or until cooked through. Remove the chicken from the pan and let it rest for 5 minutes. Meanwhile, spoon some of the fat out of the pan leaving the drippings and caramelized bits. Place the pan over medium high heat, add water the juice of one lemon, and bring to a boil. Scrape the caramelized drippings from the bottom of the pan and stir to dissolve into the liquid. Reduce the liquid by half. Once the pan juices have reduced, turn off the heat and add the butter. Swirl the butter around the pan by gently shaking the handle; the butter cools the sauce and makes it glossy. Taste and adjust the seasoning as necessary. Spoon the pan sauce over the chicken and serve immediately. Serve the chicken with roasted potatoes or Brussels sprouts. A squeeze of lemon over the veggies compliments the lemon in the pan sauce. Switch it up! Use white wine instead of water for a dry fruity twist. Try a squeeze of fresh orange juice rather than the lemon…. yum! For those that prefer a dairy free option, use 1 tbsp of EVOO instead of butter to make the sauce rich. We don’t like white meat.. we always eat legs and thighs. I know it would taste just as great. I love roast chicken too! This sounds great, I’ll try this next time. Really? Awesome…I hope you like it!